After a tough first week in the Round of 8 at Kansas Speedway two weeks ago (Oct. 20), Cole Custer likely needed to win in order to race for an XFINITY Series championship this season. That’s exactly what he did in Saturday’s O’Reilly Auto Parts 300 at Texas Motor Speedway. Custer began the race from third, remaining among the top five for much of the race. At the conclusion of the first stage, the No. 00 car gained one position to finish second, earning nine stage points. The second stage belonged to Custer, cruising to the green-and-white checkered flag. Avoiding chaos in the final stage, fuel mileage became a factor and Custer pitted for what turned out to be the final time on lap 135. Some of his closest competitors — in the race and the championship battle — pitted at lap 127, so when a caution flew with 13 laps to go, they pitted. Custer was the leader. But it was a green-white-checkered restart that gave Custer and Tyler Reddick the opportunity to duke it out for the win. Coming off Turn 2 on the final lap, the No. 00 got a big run on the No. 9 car, and though banging doors, was able to get by the victory — Custer’s first victory of the season. The victory clinches Custer a spot into the Championship 4 race at Homestead-Miami Speedway in two weeks (Nov. 17). Just last year, the California native picked up his first XFINITY victory at the track, leading 180 of 200 laps. Reddick finished the race in second, while Austin Cindric, John Hunter Nemechek and Justin Allgaier rounded out the top five. Tyler Reddick is off to quite the start to begin the Round of 8, currently sitting second on the playoff grid. That might comes as a surprise to many people. Reddick kicked off the season with a bang by winning at Daytona in the closest margin of victory in NASCAR history. But he didn’t get another top-five finish until the 10th race of the year at Dover International Speedway. After that? 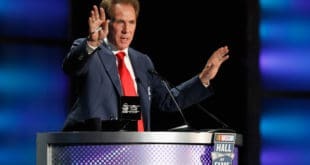 His next top five was in early September at Darlington Raceway, limping into the playoffs. However, a runner-up finish at Indianapolis Motor Speedway built a bit of confidence into Reddick. And since the postseason began at Richmond Raceway, Reddick has four top 10s in five races, nearly missing out on the victory at Texas. The No. 9 car had the lead on the final restart of the race, shooting out to a lead of a half-second. But it was a mistake of hitting the apron in Turn 1 on the final lap that allowed Custer to get next to Reddick, beating and banging down the backstretch. Custer won. Reddick came home runner-up yet again. “I just got too caught up in holding the bottom and not really giving him [Custer] and clean air and it killed my run off,” Reddick said after the race. “Almost was able to keep him blocked enough to where he wasn’t going to be able to pull out and get the run. In the Round of 8 opener at Kansas, Reddick led a pair of laps and remained among the top five all day. The No. 9 team backed that performance up this weekend, finishing third and fourth in the first two stages. Remember, this is the same team that won the championship last season with William Byron. Whenever a driver qualifies on the pole, they have the quickest car. Christopher Bell won his fifth pole of the season at Texas in qualifying, but for the second consecutive race, was unable to get out of Turns 1 and 2 without trouble. This time, the No. 20 broke loose underneath Shane Lee to kick off another first-lap incident. The No. 20 car had to restart 32nd, but over the final 40 laps of the stage drove up to fourth, earning seven stage points. At the end of the stage, crew chief Jason Ratcliff made a packer adjustment, losing positions on pit road. Once again, Bell was able to drive up to fourth, picking up seven more points. A season filled with triumphs may have gotten away from Bell on lap 134, as Bell was turned by Austin Cindric in Turns 3 and 4. When driving the No. 20 down pit road for the crew to service it, the steering wheel was knocked to the right, with the car shaking backing and forth. Ultimately, Bell was done for the day, finishing 32nd.
.@CBellRacing's Championship hopes take a HUGE hit! Despite their differences in the past, Bell took blame for the incident. The 32nd-place finish marks back-to-back finishes outside the top 30 for Bell. Though entering the round 33 points above the cut-line, the No. 20 team heads to ISM Raceway next week almost having to win, 34 points out. Earlier this season Bell started and finished fourth in Phoenix. Team debriefs will be a rough day at the office in many organizations this week. Not one, not two, but three different organizations were involved with wrecks with a teammate on Saturday, all in the second half of the race. On a lap 139 restart, Brandon Jones got loose entering Turn 1, which was a trouble spot for multiple drivers, and collided with Ryan Preece. While the No. 19 team was able to continue on and finish sixth, Preece smacked the outside wall, ending his day prematurely. 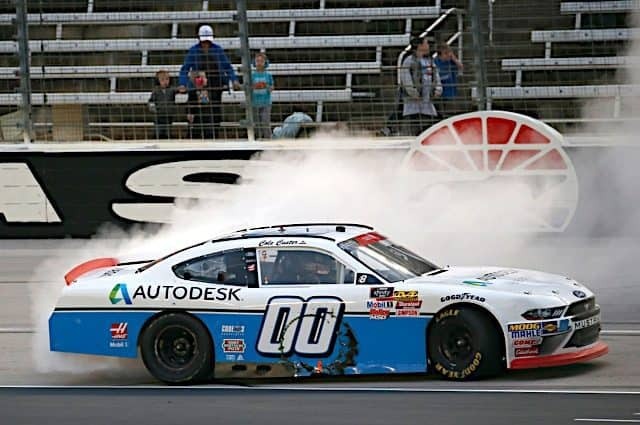 The second incident of the day involving teammates came with 13 laps to go when Ty Majeski got into his Roush Fenway Racing teammate Ryan Reed, turning the No. 16 car into the inside wall on the backstretch. This isn’t the first time the two teammates have gotten together this season. This incident was totally avoidable, just hard racing. Unfortunately, the No. 60 car has had an awful season, but decided to cause havoc on the No. 16 this week. It could be a long day at the office during the race debrief at the race shop. The final incident of the race involving teammate included a trio of Richard Childress Racing teams with six laps to go. Daniel Hemric, Matt Tifft and Shane Lee all pitted during the caution for the RFR cars getting together, but on the restart, Tifft got into Hemric with Lee finishing off the No. 21 in Turns 3 and 4. Evidently, the Nos. 3 and 21 both spun, though very costly for Hemric who is in contention for the drivers championship. Over the final few laps, he rebounded to 10th, minimizing the damage. “I don’t know what we have to do to finish these deals off,” Hemric said out of frustration. “I was frustrated when I got out of the car. Talked to Tifft there, everybody is gauging and we were the first car on four tires restarting seventh. You’ve got to be able to get to the gas in [Turns] 1 and 2, and I got to the gas with the guys in front of me – had a little run — the [No.] 2 must have had a run on me and drove into my left rear and about crashed me. 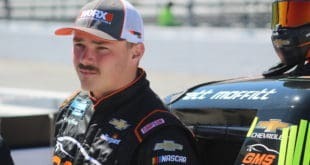 Given that it’s a 33-race season, Hemric expects contact with teammates, but it’s the fact he’s fighting for a championship that he’s upset about. Why was Texas so tricky for teammates? It could be that following the November event in 2016, the track was repaved and reconfigured, widening Turns 1 and 2 by 20 feet. However, that made for a narrow racing groove, and should a driver run a higher line, it could be treacherous. Four races have been run at TMS since the reconfiguration, but this race was the nemesis for some teams. With all the trouble, it’s made for an interesting championship battle. 2018 has a been a season of growth for rookie driver Chad Finchum, and Texas was arguably his best race to date. It all started in qualifying, when Finchum drove the No. 40 car to a career-best 19th-place starting position, just behind the big teams in the series. From the drop of the green flag, it was about maintaining track position. During an eventful first stage, Finchum dropped six positions to 25th, though maintaining pace with cars running on a similar budget to the MBM Motorsports team. In the second stage, the No. 40 car drove up the scoring pylon to 23rd, just behind Ryan Reed. But it was during the final half of the race where Finchum avoided mayhem en route to a 17th-place finish, ahead of two Joe Gibbs Racing machines, one Richard Childress Racing ride and a Roush Fenway Racing car. It’s the first time in his brief career that the Tennessee native has back-to-back top-20 finishes. Finishing 17th, in front of some of the Goliath’s in the XFINITY Series is a morale victory for Finchum and the No. 40 team. It’s been a drastic difference comparing the two halves of the season (six top 25s in the second half, two in the first half), as he gets more comfortable racing in the top preliminary division of motorsports in the world. 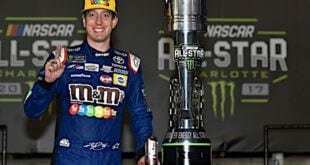 Just like all postseason races, all drivers running for Monster Energy NASCAR Cup Series points are not allowed to race in the XFINITY Series. With that rule instituted, only two drivers will be running in Sunday’s race, and Ross Chastain had the best outing in 11th, while JJ Yeley was close behind in 15th. Much like Kansas two weeks ago, Texas was a race filled with uncertainty and chaos. Late in the race, four different playoff drivers had control of the race, though the gloves were off on the final lap and Custer prevailed with the win. This is one driver that the remaining three in the Championship 4 will not want to race against for the championship. After starting second at Homestead last season, Custer passed Tyler Reddick early in the race and didn’t look back. At times the No. 00 car led by over a half lap. Meanwhile, Reddick sits second on the playoff grid, 20 points above the cutoff. Elliott Sadler is +13, while Daniel Hemric is +12. Despite winning five races during the regular season, Justin Allgaier is 12 markers out of the transfer spot, with Matt Tifft -14, Christopher Bell -34 and Austin Cindric -61, having to win in the desert next week. The XFINITY Series will head to its penultimate race of the season next Saturday (Nov. 10) at the revamped ISM Raceway, where the start/finish line is on the old backstretch dogleg. William Byron is the defending winner of the event, though Daniel Hemric and Cole Custer had a classic battle for the final transfer spot to get to Homestead. The West Virginia/Texas game was special. “Punches ticket”? Barring a career-ending injury, he was going to be in that event.